Marking the first time a children’s chorus has opened the Mostly Mozart Festival in its 51-year history, the Young People’s Chorus of New York City (YPC) and its Founder and Artistic Director Francisco J. Núñez, make their Mostly Mozart debuts in “The Singing Heart” at David Geffen Hall on Tuesday, July 25 at 8:00 pm and Wednesday, July 26 at 7:30 pm. YPC is featured throughout the program as the evening’s lead guest ensemble and opens the concert singing a cappella under Mr. Núñez in Mozart’s Kyrie, K. 90. The program continues with Mozart’s Symphony No. 35 (“Haffner”) performed by the Mostly Mozart Festival Orchestra paired with a collection of traditional and indigenous songs from the same era sung by YPC. The program closes with YPC, the Mostly Mozart Festival Orchestra, the Concert Chorale of New York, and pianist Kit Armstrong in Beethoven’s “Choral Fantasy” conducted by the festival’s Music Director Louis Langrée. In singing traditional and indigenous songs from Mozart’s time alongside Mozart’s Kyrie and Beethoven’s “Choral Fantasy,” the chorus highlights a folk tradition that is often overshadowed by—but is a worthy complement to—the masterpieces of the era’s great composers, thus linking YPC’s spirit of inclusivity, diversity, and exploration to the Mozartean theme of the festival. Tickets priced $35-85 may be purchased online at MostlyMozart.org, by phone via CenterCharge at 212.721.6500, or in person by visiting the David Geffen Hall or Alice Tully Hall Box Offices. YPC returns to Lincoln Center in October to sing the U.S. premiere of Meredith Monk’s Dancing Voices at the White Light Festival. 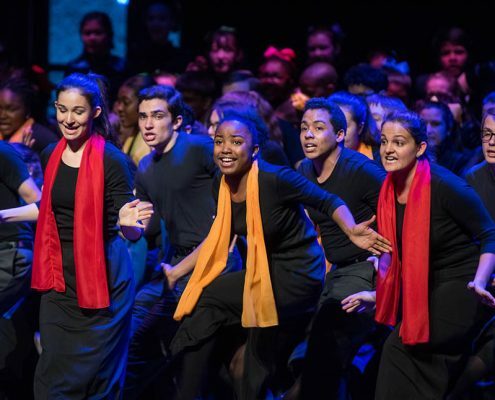 Young People’s Chorus of New York City is a world-renowned youth chorus founded in 1988 on a mission of diversity and artistic excellence by Artistic Director Francisco J. Núñez, a MacArthur Fellow. While harnessing the power of music to fulfill the potential of children, the program has heightened an awareness of the ability of children to rise to unforeseen levels of artistry. Over 1,600 children from ages 8 to 18 participate annually in YPC through its after-school, in-school, and community programs. YPC’s repertoire ranges from renaissance and classical traditions to gospel, folk, pop, contemporary, and world music. YPC has performed on four continents, has won over a dozen gold medals in international choral competitions, and has invigorated the repertoire for young voices by commissioning and premiering over 100 compositions from today’s most distinguished composers. YPC is a recipient of the National Arts and Humanities Youth Program Award, America’s highest honor for youth programs. For more information, visit ypc.org. The Mostly Mozart Festival is a presentation of Lincoln Center for the Performing Arts (LCPA), which serves three primary roles: presenter of artistic programming, national leader in arts and education and community engagement, and manager of the Lincoln Center campus. A presenter of more than 3,000 free and ticketed events, performances, tours, and educational activities annually, LCPA offers 16 series, festivals, and programs, including American Songbook, Avery Fisher Career Grants and Artist program, David Rubenstein Atrium programming, Great Performers, The Performing Arts Hall of Fame at Lincoln Center, Lincoln Center at the Movies, Lincoln Center Emerging Artist Awards, Lincoln Center Festival, Lincoln Center Out of Doors, Lincoln Center Vera List Art Project, Midsummer Night Swing, Mostly Mozart Festival, White Light Festival, the Emmy Award–winning Live From Lincoln Center, and Lincoln Center Education, which is celebrating 40 years enriching the lives of students, educators, and lifelong learners. As manager of the Lincoln Center campus, LCPA provides support and services for the Lincoln Center complex and the 11 resident organizations. For more information, visit lincolncenter.org.